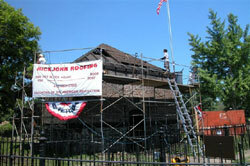 The Fort Pitt Block House, the only structure original to Fort Pitt and the oldest landmark in the City of Pittsburgh, will be getting a new roof courtesy of Rickjohn Roofing, Inc. of Carnegie who is donating all material and labor for the project. 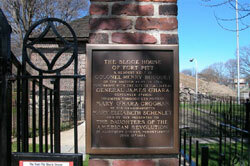 The Fort Pitt Society of the Pittsburgh Chapter of the Daughters of the American Revolution, who have owned and administered the Block House as a historic landmark since 1894, were in the process of applying for grant money from the Pennsylvania Historical and Museum Commission to fund the repairs when Rickjohn Roofing came forward and offered to donate the entire roof project. 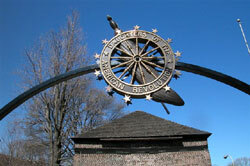 When Rick and Bobby heard the daughters of the American Revolution they both said no charge. There estimator John Paul was very helpful in putting this all together as well. Rickjohn Roofing, Inc., based in Carnegie Pa, and also Jacksonville Fla. was founded in 1975 by Rick Gammiere and Bobby Wallo. Both men are native Pittsburghers and both have extensive experience restoring historic homes and churches. Most notably, they undertook the restoration of 11 National Register properties in Charleston, South Carolina following Hurricane Hugo in 1989. Bobby Wallo was very instrumental in that project. The existing cedar shake roof, installed in 1948, replaced the 1894 roof that had been put on when the building was restored following its presentation to the Pittsburgh Chapter by Mary Schenley. Records indicate that the decking upon which the 1948 shakes were nailed was not replaced at that time but rather a new decking was laid over the old. Consequently, the removal of all of the decking during this current roof replacement presents a rare opportunity to view the skeleton of the Block House roof. In it, uncertain how many rafters could be original to the building’s 1764 construction. The second-story ceiling of the Block House is covered with overlapping wood panels that conceal the rafters from the inside. 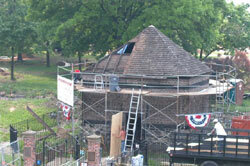 Those panels, possibly recycled clapboards from the barracks of Fort Pitt, will remain in place during the roofing project but the approximately 3-4 feet of space between those panels and the peak of the pyramidal roof of the historic landmark will be exposed from the exterior with the roof removed. This “attic” space has not been seen by anyone living today. What space contains is unknown, at least until the first week of June when work is scheduled to begin. 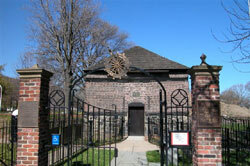 Historic Preservationists and Archaeologists will be on-site during the roofing project to examine the nineteenth-century architecture and recover any historic material that may be associated with the Fort Pitt Block House.